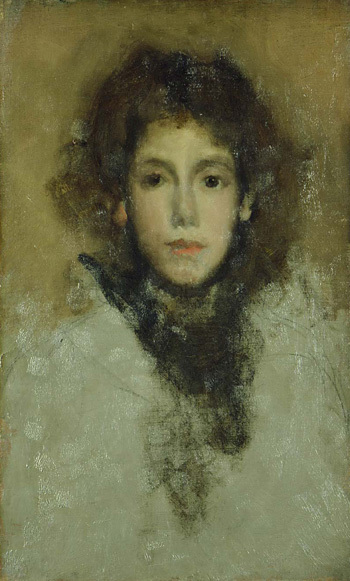 Research on the online catalogue is centred in the University of Glasgow (recipients of Whistler's estate), benefitting from the support of The Hunterian, the School of Culture and Creative Arts (SCCA), Special Collections, University of Glasgow Library, and the Humanities Advanced Technology and Information Institute (HATII), with collaboration between art historians, technical art historians, conservators and curators. The research team is led by Dr Margaret MacDonald, Professor Emerita and Honorary Professorial Research Fellow, in SCCA, in collaboration with Research Associate Dr Dr Grischka Petri (University of Bonn) and computing consultant Graeme Cannon (Information Studies), with Carolyn Alexander as administrative assistant, and Alicia Hughes, intern. Technical input came from Dr Joyce Townsend, Chief Conservator, Tate Britain, and other colleagues including Dr (now Professor) Erma Hermens, Rijksmuseum. Information on the frames has been provided by Dr Sarah L. Parkerson Day. Biographies were mostly written by Dr Joanna Meacock, Glasgow Museums, and M. MacDonald, with valuable input from genealogists Tahitia McCabe and Antoinette Sutton. IT assistance was provided by Helen MacDonald, Glasgow Women’s Library. Copy-editing is by MacDonaldEditing, Leiden, and members of the Project Team. The project is based on collaboration between four major collections: the University of Glasgow (recipients of Whistler's estate), the Art Institute of Chicago, the Freer Gallery of Art, Washington, DC, and the Colby College Museum of Art, which together form the Lunder Consortium for Whistler Studies. It is supported by many major collections including the Frick Collection and the National Gallery of Art, and includes paintings in public and private collections. Our distinguished Editorial Board includes Dr Lee Glazer, Freer Gallery of Art; Dr Martha Tedeschi, Art Institute of Chicago; Professor Pamela Robertson, former curator at The Hunterian; Dr Susan Galassi, The Frick Collection; Ruth Fine, former curator at the National Gallery of Art; the late Robin Spencer, University of St Andrews; Justin McCann, Colby College Museum of Art; Dr Linda Merrill, Emory University; and Martin Hopkinson, formerly curator at The Hunterian.